Who can use the iWALK - is the iWalk hands free crutch suitable for you? For most people, the answer is YES! Using The iWALK2.0 is easy and intuitive. In short, if you can walk, then you can iWALK. Who can use the iWALK ? We have found that the iWALK2.0 works for most people, but not everyone. So here’s a quick test: Before your injury, could you walk unassisted? Could you go up and down stairs without requiring the handrail for balance or support? If you answered yes to both questions then you should have the physical ability to use the iWALK2.0. Everything else you need is listed below. iWALK2.0 is the best crutch alternative for almost everyone – including YOU! Who can use the iWALK ? While the iWALK2.0 hands free crutch works for most people with lower leg injuries, it isn’t suitable for everyone. Before you decide to use the iWALK2.0, carefully review the information below to determine if the iWALK2.0 is right for you and suitable for your injury. Before your injury, could you fluidly walk up and down stairs at a normal pace, without using a hand rail? You are challenged by normal activities like walking, climbing stairs, etc. Do you need to use the handrail to go up or down stairs? You weigh over 275 pounds (125 kg) or are significantly overweight. Why does this matters? The iWALK2.0 is suitable for use with almost any lower leg or foot injury. However with any injury is advisable to consult your doctor or physiotherapist. 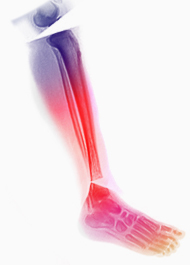 Injuries include foot fractures, sprained ankle, broken ankle, Achilles tendon rupture, Achilles tendon injuries, bunions, tiba fracture, fibula fracture, Jones fracture, plantar fasciitis, stress fractures (lower leg), below knee amputation, foot and ankle dislocations, foot ulcers, calf muscle tear, calf muscle strain, gastrocnemius tear. If you have any injury to the knee or above the iWalk will not be suitable. 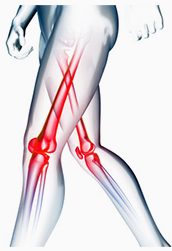 So common conditions like ACL tears, MCL tears, patella conditions, other knee injuries, hamstring tears and strains, groin injuries, piriformis injuries, IT band issues, illiopsoas (hip flexor) conditions, diabetic ulcers where proprioception issues adversely affect balance or any other knee or above upper leg injury are not suitable for use with the iWALK. If you’re over 60, pay careful attention to who can use the iWALK as the iWALK2.0 might not be for you. The iWALK2.0 has been used successfully by people in their 70’s and beyond, but we’ve also seen that it was unsuitable for people in their early 60’s. Mobility capabilities vary greatly from individual to individual, so it’s difficult to put precise age limits on who can use the iWALK2.0. So instead of AGE LIMITS, we’ve found that ABILITY LIMITS work much better. As long as you keep your expectations reasonable, and follow our ability guidelines, then age alone isn’t a governing factor in whether you can use the iWALK2.0. ABILITY GUIDELINES – If you could walk with normal gait, unassisted prior to your injury, then you’re likely a good candidate for the iWALK2.0. Further, if you could go up or down stairs quickly, without requiring a handrail for balance or support, then you should have the physical ability to succeed on iWALK2.0. If you meet them all of the ability guidelines then you can be confident that the iWALK2.0 will work for you. If not, you should choose a different mobility device like a knee scooter. Diabetic foot ulcers are often accompanied by Neuropathy, or damage to the peripheral nerves of the foot or feet. This can cause numbness and reduced proprioception, making basic balance difficult. 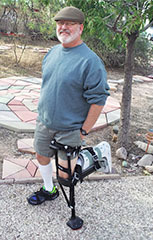 If you have difficulty balancing on your non-affected limb, then the iWALk2.0 will probably not work for you. To find out, try this – If, in addition to the qualifications listed above, you can stand unassisted on your unaffected foot for 30 seconds, without assistance, then you’re likely capable of using the iWALK2.0. But because of the special circumstances surrounding diabetic induced Neuropathy, we recommend that you check with your physician or therapist prior to using the iWALK2.0. If your diabetic condition resulted in lower leg amputation, see the additional guidelines below. 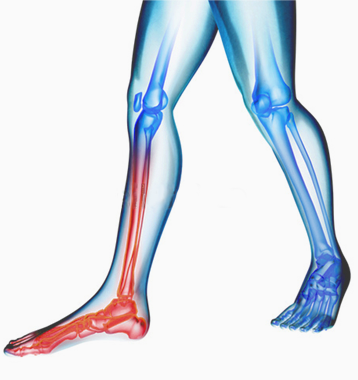 Body mass can play a significant role in the way the crutch functions. 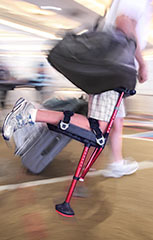 The iWALK crutch needs to become an integral part of your leg in order to function at maximum efficiency. If your leg moves, the crutch moves accordingly. Any excess movement makes the crutch harder to use and less efficient. And, the fact is that the more body fat you have, the more “compressible” flesh you have, which allows more movement of the crutch. The less movement, the better – you want the crutch rock solid beneath you. 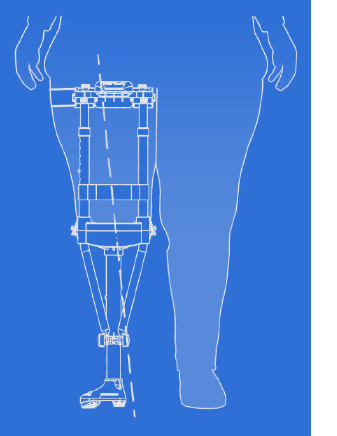 Also, being overweight introduces different thigh shapes that can exceed the adjustment limits of the iWALK that relate to where the foot will be positioned. So if you’re overweight, does that mean you can’t use it? Not necessarily – we’ve seen people of all shapes and sizes use the crutch successfully. Just be aware that people with high body mass indexes may have more difficulty, especially initially, and should set realistic expectations before purchasing the iWALK. iWALK2.0 is becoming increasingly popular as a daily living aid and a transitory / training device for new below knee amputees. The only special requirements for below knee amputees are that you have a minimum of 4” (10cm) of residual limb and you can tolerate weight on your existing shin. 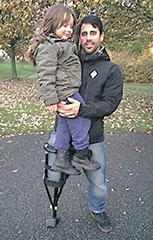 Above knee amputees cannot use the iWALK2.0 without a prosthetic assistive device. New amputees – iWALK2.0 is used after amputation instead of crutches or a wheelchair. 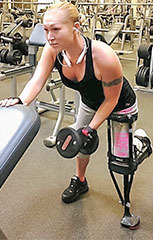 It allows you to maintain muscle strength and train in the use of a prosthetic leg prior to your permanent prosthetic. It also allows you to maintain your lifestyle when you cannot tolerate your prosthetic or it’s being repaired or resized. Existing amputees – iWALK2.0 excels at providing hands free mobility for those times you don’t want to use your prosthetic leg. You can walk in comfort and stability. You can do many things where you don’t want to expose your expensive permanent prosthetic to water or contaminants. Donning and doffing is faster than for non-amputees because you don’t need to unbuckle the lower straps as your foot will not interfere with slipping directly into the crutch. Find out by seeing our sizing information located here Will the iWALK2.0 fit you? iWALK2.0 can give you back the mobility you lost due to your injury. What it can’t do is give you something that you didn’t already have, so if you couldn’t walk normally pre-injury, then iWALK2.0 probably isn’t going to work for you. So if you’ve read all of the qualifications and you’ve determined you’re a good candidate, the next crucial step is to follow our instructions for Fitting and First Use. Do this, and you’ll be iWALKing with safety and comfort in no time.